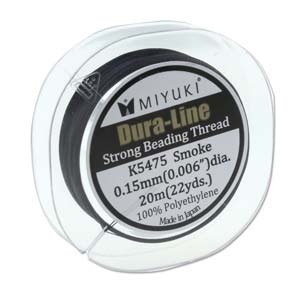 Miyuki Dura-Line Braided Beading Thread is now available in different colors and sizes. 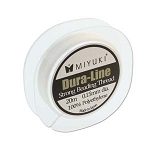 Dura-Line is a new 100% Polyethylene Braided Beading Thread made in Japan by Miyuki, the makers of Delicas. 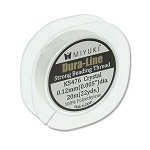 Dura-Line is a very popular beading cord especially for seed bead projects. We have Crystal Clear and Smoke Colored Dura-Line in 0.12mm and 0.15mm sizes. 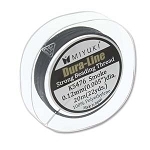 Each spool contains 20 meters which is 22 yards which is approximately 65 feet of Duraline.